Our most popular package amongst our small businesses and start-up clients. While you may want a fully bespoke site not all businesses have the finances to afford this type of development. Our starter package is the perfect solution. 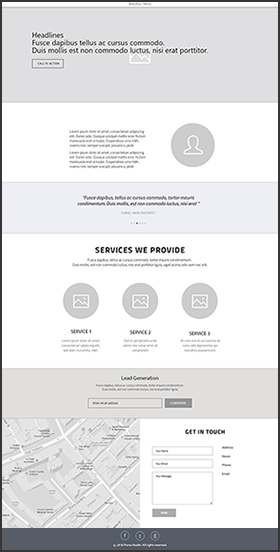 A simple one page website provides an affordable way to secure your place on the web and act as a lead generation tool that can grow with your business. The key to having a single page site is focus. Users will not scroll for hours if you try to put a full site in a single page! Think about what content you would want in a full website. Each area of content would become a section on the single page site. For each content type what would the highlights or most important peices of information be? The aim is just to give enough information to get a user interested enough to fill out your contact form or claim your lead magnet offering. As your business grows your website can grow with you by adding new pages with extra content and functionality. Start to build your web presence with our affordable starter sites.